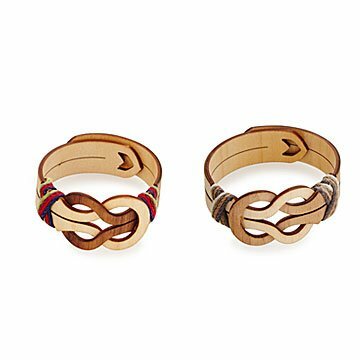 Henry Wischusen crafts this bracelet from raw maple and walnut, weaving the wood into an infinity symbol. This modern, sophisticated twist on the classic friendship bracelet is a stylish way to celebrate your bond. Henry Wischusen crafts this bracelet from raw maple and walnut, weaving the thin slices of wood into an infinity symbol. He then adds a piece of sweetly wrapped twine, inspired by the BFF versions from grade-school days. Two arrows meet where the bracelet closes—a nod to an iconic symbol of friendship and one of many subtle details that makes wearing this piece a sentimental reminder of what is most important in life. Handmade in Peachtree Corners, Georgia. Please note: The bracelet will naturally relax with your body warmth to create a comfortable fit. Raised on the rocky coast of New England, Henry Wischusen grew up with an appreciation for his surroundings and traditional woodworking. As a kid, he made all kinds of things out of wood, from tiny sculptures to boats. After more than three decades in the corporate world, he returned to his roots, creating organic works of art with a focus on sustainability. By using intricately woven wood veneers, he's able to let the material's natural beauty shine through while maintaining his committment to keeping forests intact. Delighted with the bracelet in every way. Gave as a gift to my dear friend to thank her for her decades of love and support. This bracelet was unique, beautiful and we'll crafted. Beautifully crafted with a unique style. I purchased one of these bracelets to give to a close friend. When she attempted to (carefully) get it on her wrist, it broke in two. The workmanship is absolutely beautiful! I love the bracelet, and I am so bummed it broke so easily. It was very brittle... and I will need to return it. My bff was super excited and loved it. However when she went to put it on, it snapped it two. She felt so bad for breaking her bday gift, but it was very hard so maybe it was dried out? Not sure, but not happy. Will be returning and purchasing something else. This bracelet is so beautiful! I love this bracelet! It's definitely worth the price, as you can tell it was professionally made. The wood has a fine finish and it's not too chunky or thin. I'm very happy with my purchase! Very disappointed with bracelet. Went to put on first time and it broke in two. It's being returned in the 2 pieces. Seemed like it was dried out or something. This item is not at all pliable. I put it on my (very small) wrist and it seemed as though it would be highly breakable. It's sad because I love the message of the bracelet and the design. I just have very little faith that it will last very long.